Now, however, in her fourth year as executive director of the Los Angeles Philharmonic Association, Samuel has found her stride in pushing forward the greater whole of one of the world’s premier orchestras. Her tenure at the L.A. Phil has evolved nearly 30 years and encompassed a slew of critical positions, from orchestra operations management to chief operating officer to vice president and general manager. Now, as executive director, Samuel oversees the Hollywood Bowl, non-classical programming by the association at the Bowl and the Walt Disney Concert Hall, concert production and community affairs. She still can’t believe her good fortune of working at the L.A. Phil, now in its centennial year. “We used that a lot for a while, then we backed off it,” Samuel deadpanned. It was a thrill, of course, and marked what people living here already felt. “We’ve experienced this tremendous growth. … All of Los Angeles has really developed and become known and seen as a creative hub and creative center, and to have that acknowledged by someone like the New York Times, to see it recognized, is very exciting,” she said. It took years for the West Coast to be taken seriously for music, she recalled, noting that with the historic center of orchestral music in Europe, it was difficult for L.A.’s relatively new orchestra to make its mark. The L.A. Phil is said to be redefining what orchestra music can entail, putting on more than 250 concerts a season at the Frank Gehry-designed Disney Hall and the Hollywood Bowl, with musical programming as diverse as the city it represents, including jazz, world music, orchestral pop and pop/rock. 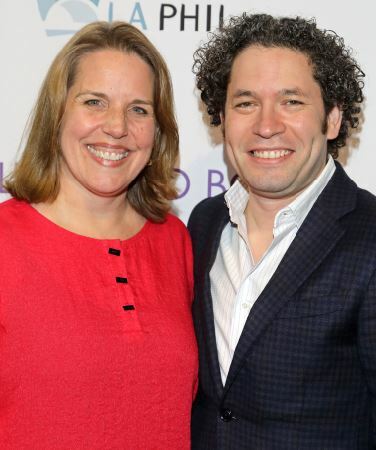 Under the vibrant leadership of Music and Artistic Director Gustavo Dudamel, the orchestra is pushing boundaries with the ambitious, adventurous attitude that has long defined the West Coast. With the L.A. Phil’s centennial underway, and the Hollywood Bowl on the cusp of turning 100 in 2021, Samuel and the association have given much thought to the next 100 years in the Greater Los Angeles area. Part of that future is a deep commitment to education and development of diverse audiences and performers of all ages, colors and ethnicities, including those with diverse socioeconomic backgrounds, Samuel noted. Through Dudamel’s Youth Orchestra Los Angeles program — inspired by the way he was brought up in Venezuela, in the music education program called El Sistema — the L.A. Phil and its community partners provide free instruments, intensive music training and academic support to students from underserved neighborhoods. The program will soon complete its fifth center of operation with a new permanent YOLA center, called the Judith and Thomas L. Beckmen YOLA Center at Inglewood, designed by Gehry. While the association has a long history of education and community programs (after the Los Angeles riots in 1991, the L.A. Phil dived into community concerts at local churches, actively trying to pull communities together through music), Samuel said this remains a strong part of the mission. Some the first participants in the YOLA program, which was initiated in 2008, are already in college and studying music, and Samuel is hopeful they will come back and become a part of the symphony. Samuel is also a passionate supporter of her hometown, Pasadena, its public schools and community programs. Both of her sons, Samuel and Orlando Christian, attend Blair Middle School. Samuel’s husband, William Christian, is a professional actor, and the entire family has been very involved at A Noise Within, where Samuel joined as a board member last year. One of her sons is now in his seventh production there. She praised the playhouse as well for its diversity of programming, which symbolizes what she sees as representing Pasadena’s rich cultural backgrounds. 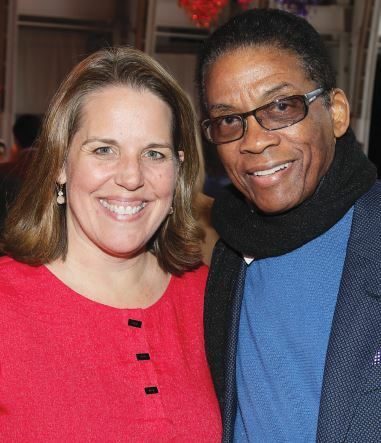 Going forward, at home in Pasadena and at the L.A. Phil association, Samuel will remain a staunch supporter of the diverse fabric threading together the Greater L.A. communities. She hopes this can be strengthened through musical and educational programming.